What is a National Drug Code (NDC)? 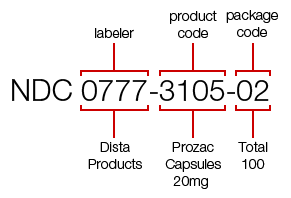 The NDC, or National Drug Code, is a unique 10-digit, 3-segment number. It is a universal product identifier for human drugs in the United States. The code is present on all nonprescription (OTC) and prescription medication packages and inserts in the US. The first set of numbers in the NDC identifies the labeler (manufacturer, repackager, or distributer). The second set of numbers is the product code, which identifies the specific strength, dosage form (i.e, capsule, tablet, liquid) and formulation of a drug for a specific manufacturer. Finally, the third set is the package code, which identifies package sizes and types. The labeler code is assigned by the FDA, while the product and package code are assigned by the labeler.